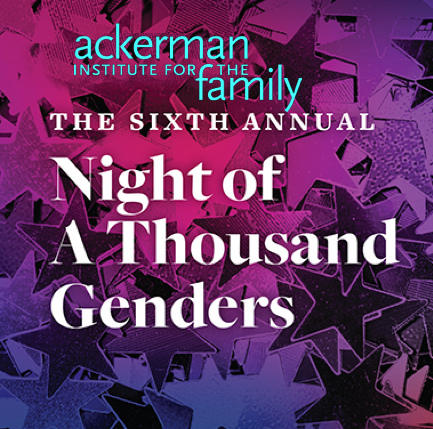 The Gender & Family Project presents their sixth annual Night of A Thousand Genders event that supports transgender youth & families & takes place on Monday April 8th at 6P at the Edison Ballroom at 240 W 47th Street in NYC. This year’s honorees are New York City Council Speaker Corey Johnson with the Gender Inclusivity Ally Award & social activist, entrepreneur & writer Jodie Patterson will receive the Family Award. Honorary Co-Chairs are Dee TrannyBear & Deja Smith, Asia Kate Dillon, Tyler Ford, Olympic Athlete & LGBTQ Activist Adam Rippon, model & Trans Rights Advocate Geena Rocero. Under the music direction of Lance Horne the performers will include, Peppermint, the First open Transwoman to originate a leading role on Broadway & Jaimie Wilson one of the top influencers & artists in the LGBT community. There will be cocktails, hors d'oeuvres & dinner followed by a concert at 7P with a must-attend after party at 8:30P. The Gender & Family Project (GFP) empowers youth, families & communities by providing gender affirmative services, training & research. GFP promotes gender inclusivity as a form of social justice in all the systems involved in the life of the family. Founded in 1960, the Ackerman Institute for the Family is one of the premier institutions for family therapy & one of the best-known & most highly regarded training facilities for family therapists in the United States. The Institute serves families from all walks of life at all stages of family life.